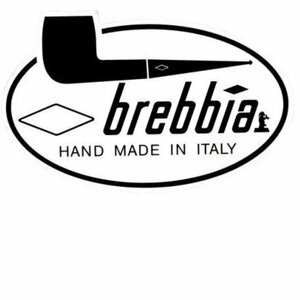 Briar pipe in a metallic look made by Brebbia in Italy. Brown transparent mouthpiece with 9 mm. filter or without with the free converter. Straight Falcon pipe with a twisted chrome/red stem and an Apple bowl in standard finish. Beautiful smooth briar pipe in a dark brown/grey colour with a nickel mount, acrylic army mouthpiece. 9 mm. filter. Straight Falcon pipe with a twisted chrome/red stem and a Genoa bowl in standard finish. Sandblasted green briar pipe with a classical shape, made for Charles Rattray's (tobacco), green acrylic mouthpiece. 9 mm. filter. Briar pipe in a semi matte finish with a brass ring made in Italy. Acrylic mouthpiece, 9 mm. filter. This poker pipe is a unique design of Erik Nording, a combination of quality briar, coloured metal and a black matte heat cap. A simple pipe with a metal shank, but it smokes very well.